I begged from weary pastoral knees. I pleaded as frustrated tears poured from my bloodshot eyes. I explained that I thought I was ready to deal with her 2 weeks ago...before going on vacation. But it seemed that the more time I spent with her the less I understood her. She smiled and made some remark about how I should understand that dilemma after 16 years of marriage. All I knew to do was to hire a few friends to help question her. I hired Matthew Henry to begin the inquisition. Honestly, I didn't understand a thing he said to her but I am sure it was accurate. And his books look really good on my shelf. I nodded as he spoke so I'd at least LOOK semi-intelligent. John Phillips came back from the dead to "explore" the matter. The blood-bought Brit wrestled, wrangled, and writhed with her. But despite his prodding, poking, and pleading she provided no remark! No reason! No relenting! There was no answer! No admission! No acknowledgement! Warren Wiersbe's line of questioning was too balanced for such a hard case. When Jerry Vines raked her over, all she wanted to talk about was her demon-possessed daughter. Her words provided great "Help for Hurting Parents" but it wasn't the exact information I was seeking. Dr. Falwell strode in with the Old Time Gospel Hour Bible Commentary. At the end of his spiel she enrolled in 3 classes at Liberty...but said nothing about the whole "dog" thing. And the distinct smell of cigarette smoke on the old Baptist reminded me to never buy books from smokers on eBay again! Calvin said he was predestined to simply smack her with the truth. If it was the Sovereign will of God for her to speak she would be irresistibly led to do so. No pragmatic devices would be employed on his part to get her to speak. If she'd been Baptist he could have threatened her with martyrdom. But alas, she was a Canaanite. So having no other choice, he elected to leave. I thought she would relent when I brought in MacArthur. 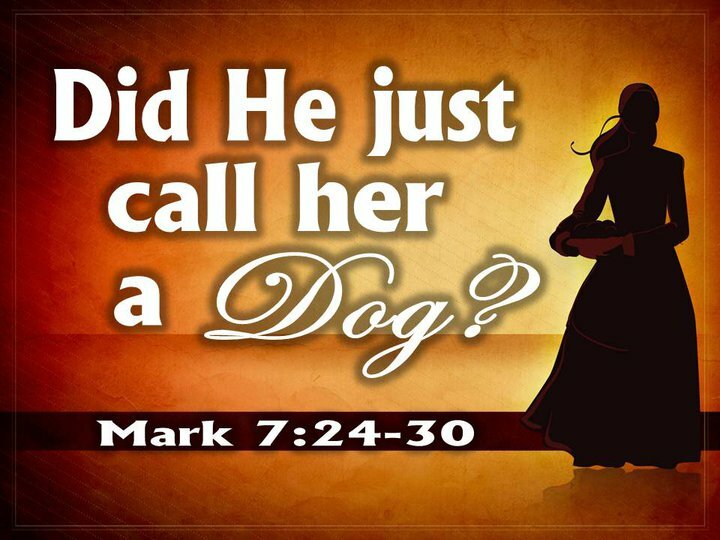 He got right in her face with a report about a parallel incident from Matthew 15. She mumbled something about Markan priority and clammed up again. Mark Driscoll got further with her than any of the others...letting loose on her with a string of blistery questions more appropriate to a drunken sailor (OK, not really a drunken sailor because the Bible clearly condemns drunkenness. Just a sailor that had overextended his use of Christian liberty). But alas, I couldn't use any of his material in the polite company of the Emmanuel pulpit so in the end it was useless. Herbert Lockyer did ALL he knew to do before resigning. David Cloud came in with the Sword of the Lord commentaries. He dressed her down over her short hair style, her NKJV, and for even being in the office of a compromising Southern Baptist preacher. It had something to do with Billy Graham talking to the Pope back in the 70's. I didn't really follow his line of questioning but I do know it had nothing to do with the matter at hand in Mark 7. Just when I thought I would have to take out the rubber hose and the water board, I remembered something. This old Syrophoenecian woman was a redeemed slave of Jesus. 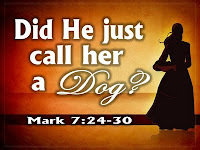 Indeed, she was one of a very small number of Gentiles actually saved during Jesus' earthly life. Some say the only one. Maybe if I asked Him, He would tell me why He dealt with her that way. Yes! That's it! Since all the Bible is really about Jesus, why had I been wasting my time asking her? I needed to ask Him! And boy, oh boy...when Jesus revealed why He said that thing about dogs eating the kids' food...well, I nearly had revival in my office. I can hardly wait to spill the beans Sunday morning at 9a and 10:30a.